Alexander Campbell and Barton W. Stone both came out of Presbyterianism. 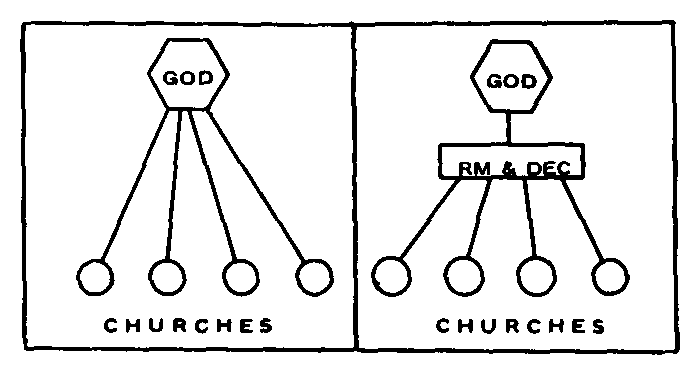 It was difficult for them (much more difficult for Campbell than for Stone) to give up the idea of some sort of ecclesiastical "organization of the churches." It is true that Campbell in "The Christian Baptist" wrote much in defense of the congregational autonomy and independency of the churches; but it is also true that he urged the Wellsburgh Church, of which he was a member at the time, to join the Mahoning Baptist Association when it was organized in 1820. He was not pleased ten years later when this Association dissolved. Early in the 1830's the "Cooperation Meeting" came into popular use among the disciples. These meetings were simply mass meetings of disciples of certain areas, in which congregations were represented by their delegates or messengers, and which made "recommendations" or "suggestions" to the churches. They were innocent looking, and were careful to leave the churches free and independent. But they were a clear (and in the light of subsequent history, inevitable) forerunner to the organized society which was to come twenty years later. Once again, and without even recognizing what was happening, men who wanted only to serve the Lord were falling into the old, old error of Catholicism — seeking to devise some plan, some arrangement, some method, some "cooperative" by which and through which congregations could pool their resources and make it possible for a number of congregations to function as a unit. Their task was enormous, and it is indicative of their faith and consecration that they were so desperately earnest in their desire to convert the world to Christ. But their very zeal perhaps blinded their eyes to the true nature of their action. The eventual emergence of the American Christian Missionary Society, organized in Cincinnati, Ohio, in 1849 was the logical fruition and the certain culmination of these early "Cooperation Meetings." When the ACMS was finally accepted by a large portion of the disciples (perhaps ninety percent), it formed the opening wedge which was to bring division and heartbreak to the body of Christ. It was the Society — not instrumental music — which was the beginning of the cleavage. This marks the real birth of the Disciples of Christ denomination as a separate religious body in America. The glorious Restoration Movement, inaugurated fifty years before with such high hopes and noble ideals was now being splintered and split by a re-re-emergence of the Catholic concept of the "church universal" as a functional body. This can be seen in the following chart." Following the Civil War there developed among the Conservative brethren in Texas what came to be called "State Meetings." These were simply mass meetings of the brethren which convened from year to year, and in which there was general visiting, preaching, and exchange of information. The meetings grew in interest and attendance, until finally many hundreds of disciples were attending. Zeal and enthusiasm were high. Stirring gospel sermons raised great ardor for advancing the cause of Christ in Texas. Finally, at one of these meetings, someone advanced the idea of taking up a collection which could be used for the support of a gospel preacher to work full time in the state of Texas. The suggestion met with instantaneous acceptance; everybody apparently approved the idea. Arrangements were made, and the collection was taken. It was a generous and whole-hearted offering; the total sum raised exceeded even the fondest hopes of those who had promoted the idea. Then a question was raised: Who shall have control of these funds? Who shall employ the evangelist, fix his compensation, and counsel with him as to where he might do the most effective work? There was one thing certain in the minds of all — they were determined not to have a missionary society! They had seen the devastation wrought by the organized societies in the churches of the east, and they were adamant in their resolution that no such organizations should disturb the peace of the churches in Texas. To avoid these unscriptural societies they resolved that ALL such cooperative efforts should be under the elders of some local church. After all, they reasoned, the church (the local congregation) is the only organization known to the word of God! And so long as nothing existed except a congregation, they felt they were on safe ground. In line with this reasoning, all the funds collected each year in the annual "State Meeting" were turned over to the elders of one of the faithful churches — usually, though not always, the church in Sherman, Texas. In addition, all the local congregations in Texas were urged and encouraged to make contributions through the year to this eldership. Brother Carroll Kendrick, who had first brought the idea of the "State Meeting" to Texas from Kentucky, gave a name to this cooperative arrangement. He referred to the elders having the over-sight of the funds as a "Receiving, Managing, and Disbursing Evangelistic Committee." The plan proved highly successful, and as the years went by, more and more evangelists were employed, the total number receiving full time support one year being no less than seventeen. Over in Tennessee, David Lipscomb viewed this Texas "Receiving, Managing, and Disbursing Evangelistic Committee" with considerable apprehension and concern. He felt that the Texas brethren, with every good motive and intention, were nevertheless falling into the old, old familiar pattern of Catholicism, Denominationalism, and Digression — they were trying to find a way, a plan, a method to "activate the church universal." By pooling their resources under an eldership rather than a separate organization they felt they had avoided any unscriptural practice. But in editorials for more than thirty years Lipscomb hammered away at the practice. He warned that they were actually seeking to find some scriptural way to accomplish an unscriptural objective — activating the church universal. Even if they succeeded in being scriptural in function, for it was never God's plan that the universal church should be a functional body. The "West Tennessee Cooperative" died aborning. Once again, the voice of wisdom and Biblical authority had prevailed. Respect for the Bible had nipped in the bud a movement that might have engulfed many congregations into an apostate form of "cooperation." It was emphasized once again, that there was no "pooling of resources" by New Testament churches for the carrying on of God's work; and that the only time contributions went from one church to another was when the receiving church was in need. The divine pattern was: Churches with ability sent directly to churches in need. 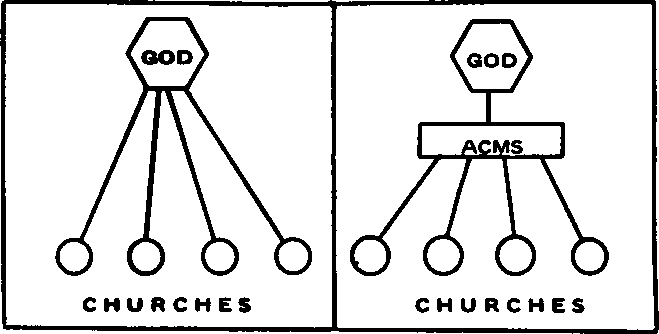 While it is true that the churches generally abandoned the "Receiving, Managing, and Disbursing Evangelistic Committee" type of cooperative action, it is also true that as time went on there were a few, widely scattered and largely ineffective efforts to revive this discarded and discredited type of congregational cooperation — until after the Second World War! Following the War, in the late 1940's, there was an intense and burning zeal everywhere in evidence among the faithful disciples for the evangelizing of the world. Missionary fervor ran high; zeal was unabated. Right at this juncture, and largely under the influence of men whose intentions were of the noblest, but who were apparently almost totally ignorant of the past history of such cooperative efforts, the old, old "Receiving, Managing, and Disbursing Evangelistic Committee" type of cooperative was brought out of the moth-balls, dusted off, given a new name, and vigorously promoted as THE way to have scriptural cooperation! The new name given to this previously discarded plan of action was a "sponsoring eldership" or "sponsoring church" cooperative. Under this plan one church would announce its plans to "sponsor" a family of missionaries to Germany, or Japan, or Korea, or Africa, or some other area, and then earnestly solicit funds from all other churches willing to help, such funds to be sent to, and distributed by, the elders of the "sponsoring" church. Later on the idea became so generally accepted that areas other than evangelization began to have "sponsors." The fact that certain orphan homes had, even earlier, put themselves "under an eldership" prepared the way for later developments. One church announced itself as the "sponsor" of a nation-wide radio and television project; another church "sponsored" a world-wide "Campaigns for Christ, International" program. A veritable flood of "sponsors" began to appear — each and all of them soliciting funds for their various programs and projects, and each one faithfully promising to keep all the work "under the elders" of the sponsoring church. Developments have become so obvious in late years that thoughtful brethren generally (along with discerning denominational leaders) have recognized these "sponsoring cooperatives" for what they actually are — organizations bearing the form of a congregational eldership but clearly functioning as an organized board of directors over works which are NOT exclusively the work of the congregation in which they serve as elders. No one can predict with any degree of certainty what is likely to happen as more and more of these "sponsoring church" arrangements appear on the scene. But it is gratifying, indeed, for thousands of faithful Christians to reflect that there are a great host of sincere and faithful servants of Christ who have NOT been swept up into the enthusiasm for these cooperatives. They are determined to follow the New Testament pattern, so clearly set forth in Acts 11:27-30; I Corinthians 16; II Corinthians 8 and 9. That pattern is simply stated: The only time funds ever went from one New Testament church to another was under circumstances in which a church with ability sent directly to a church in need.